1) Our ACV is always 60 grain, never diluted. 2) It buffers (or alkalizes) rumen and bloodfor acidosis ketosis. 3) Acts as a digestive tonic for scours, bloat, gas, refluxand indigestion. 4) Can be used for the removal of internal and external parasites. 5) Contains beneficial microbes, minerals, vitamins and nutriceuticals. 6) Creates more energy for milk production or ADGand is absorbed through the gut wall. 7) Is an immune tonic for bacterial, viral, yeast, fungalor toxins. 8) Improves the texture and flavor of meat, milk and eggs. 9) Is safe for use after just 2-3 days of age. BEEF: 3-4 oz. per day. Dose may vary with body weight, stress level, season and quality of ration. CALVES: 1-2 oz. per day. Drench calf with 1-6 oz. ACV and 1-6 oz. water mixture. (Safe after 2-3 days of age). GOATS/SHEEP: .5-1 oz. per day. If sick: Drench 20cc ACV and 20cc water for 3-5 days. RABBITS OR BIRDS: Mix 1 oz. per gallon of water or free-choice at 50/50 with water. 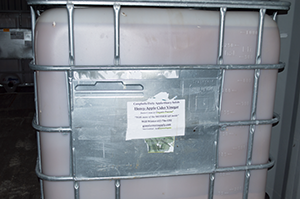 SWINE: Mix 1-2 cups of ACV with 20 gallons of water,or offer in a non-tip container. Can offer free-choice 50/50 water mixture, or even molasses. EQUINE: 2-4 oz. per day. Sprinkle on hay, in water, or 50/50 free-choice in pan. Can be used for colic, founder, or other therapy by drenching with 1 part water,one part ACV for 2-3 days.